One fan theory formed shortly after Gilmore Girls: A Year in the Life premiered on November 25, speculating a totally crazy yet possibly spot-on interpretation of the last four words, a.k.a. Rory’s pregnancy confession. 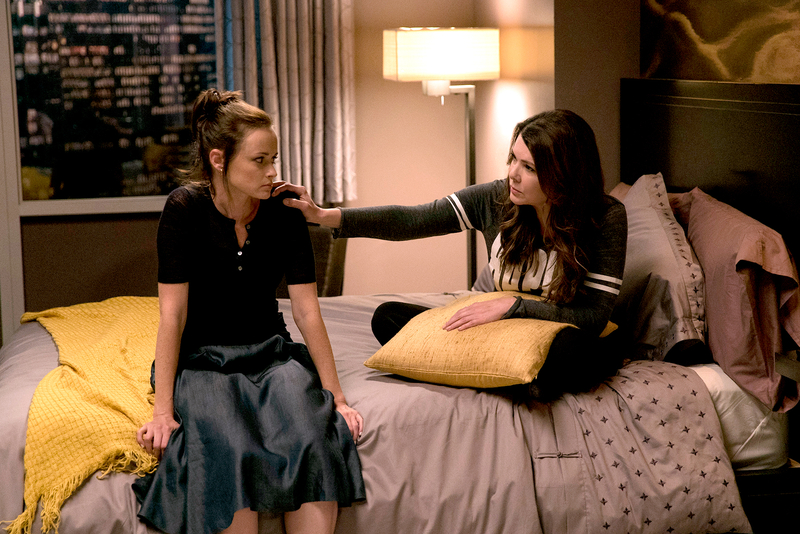 The potential twist: Rory is pregnant with Lorelai’s baby! And despite how far-fetched this theory may seem, the fan who suggested it might just be on to something that everyone else totally missed. In “Winter,” Lorelai and her hubby-to-be, Luke Danes (Scott Patterson), toy with the idea of raising a child together. Because Lorelai can no longer bear children, the couple decide to explore alternative options available for starting a family, and their findings lead them to none other than Paris Geller’s fertility clinic. (Don’t worry — we too are still completely bewildered by Paris&apos; career choice.) Although Lorelai and Luke eventually (maybe?) forgo the thought of having a child, they invest a great deal of time and energy into the what-ifs. Paris parades her surrogate mothers around Stars Hollow, and Lorelai and Luke discuss the matter time and time again in great detail, leading to many heated arguments. Although the notion of them having a baby together is not really brought up again in the following three episodes, it is never officially revealed to the audience that Lorelai and Luke dropped the idea altogether. Which begs the question: Did they? Did Lorelai and Luke decide to have a child by surrogate, and were we just kept in the dark about it until the very last possible moment? So Gilmore Girls fans are faced with a wild theory! Forget everything you may think you know about who fathered Rory’s baby, and consider this. Right under our noses, did Lorelai turn to her best friend in her time of need? Rory — the one person who has always been there for her mom no matter what, and might even know her better than she knows herself — may have given Lorelai the one thing she secretly wanted more than anything: an opportunity to raise a child with Luke. After all, Luke never did feel quite comfortable with the whole concept of surrogate mothers, so perhaps Lorelai eased his uncertainty by suggesting that they keep it in the family by having Rory carry their baby. As weird as it may be, we can’t shake the feeling that this unconventional move is something that Rory and Lorelai would totally do. Not to mention, Rory did suggest to Jess during a conversation at the Gazette that she should become a surrogate for Paris. So, who are we to assume that she didn’t do just that? Maybe, just maybe, Rory is pregnant with her sibling. This also means that there might not be an end in sight to Rory’s love story, as one of her many suitors won’t be tied down with daddy duty. Perhaps Logan (Matt Czuchry) won’t be her Christopher (David Sutcliffe), and Jess (Milo Ventimiglia) won’t be her Luke, and instead, Rory will soon be a single child no more! That said, let’s face it — our inner demons were secretly hoping for the Wookiee to be Rory’s baby daddy. Check out fan tweets about the possible twist below. #GilmoreGirls Spoiler Alert: The kid is Luke's. That's why he was so defensive about Lorelai wanting a kid via surrogate. Tell Us: Who do you think is Rory&apos;s baby daddy? Gilmore Girls: A Year in the Life is currently streaming on Netflix.